Taking Papiss! Newcastle United 2, Aston Villa 1. | NUFC Blog. To return to the beginning, Pardew went back to basics on the tactical front after recent experiments left us exposed and losing twice against Fulham and Brighton respectively. Though the last game, against Blackburn, was a victory, the 2-0 scoreline painted a deceptive picture of a game where Blackburn frequently dominated general play. So, it was back to the no nonsense, direct and workmanlike 4-4-2 which brought the team it’s long unbeaten run earlier in the season, and with none of this Ben Arfa style foreign funny business. It was a fairly quiet game until Best went down. With the Magpies temporarily down to ten men, Tim Krul saw his first real action of the game when Villa’s on loan Robbie Keane expertly threaded through the ball to fellow striker Darren Bent near the left post of Krul’s goal, Best’s short ranged effort was well blocked by the legs of the flying Dutchman though. However Krul’s block sent the ball back into play and it was eventually blasted back at him by Villa’s Stiliyan Petrov in what were probably their best two chances of the game so far. Krul finally gathered the ball after Petrov’s long range blast but it was one of those which could have trickled under. The next break in play finally saw Cisse coming on to great applause before he’d even kicked the ball. It wasn’t long until we saw him introduce himself with a decent header in the 15th minute but it was at Shay Given in the Villa goal. From the moment Cisse came on he was full of running, and his sheer athleticism proved to be a bigger handful than Katie Price for Villa from the time he trotted on. His movement was very good in that it was intelligent as well as enthuastic, and he also showed some bravery too in sticking his heed in for one or two chances where others may have backed off. It was his Senagalese partner in crime, Demba Ba, who was the first to hit the back of the net though, something which is almost obligatory now for the prodigious scorer. Although Aston Villa were generally gaining in confidence and creating some decent chances at this point (around half an hour into the game), Ba soon shut them up after Ryan Taylor dug the ball out for him to supply an assist in the box. Just after making the pass though, Villa’s Steven Warnock caught the Scouse utilty man’s shin, with Taylor somersaulting over Warnock nand out of the game. This meant that Warnock had now claimed his second Magpie victim after Best’s exit thorugh a similar incident with the Lancashire left-back’s leg. Newcastle United 1 – 0 Aston Villa. Though both sides were coming up with some decent passages of play and creating a few chances in a roughly even game, it was probably the Magpies who were just a little more threatening where it counted overall. The half wasn’t over by any means however. Due to Stephen Warnock’s Magpie massacre and all the stretcher action, referee Halsey declared that there would be no less than six minutes extra time for the first half alone. In the last of those minutes, a defensive lapse by Coloccini and Williamson allowed Toon old boy Charles N’Zogbia to thread through a cross from the left to Robbie Keane, who then hit home from point blank range in a real poacher’s effort. That was that for the first half. Half time: Newcastle United 1 – 1 Aston Villa. Cisse’s menacing ways continued in the second period, however he wasn’t the only one to shine by any means. Danny Guthrie also had an excellent game overall. With James Perch once again putting in a respectable no nonsense performance in the defensive midfield role, Guthrie could concentrate more on playmaking in the middle of the park, and it was he who gave Cisse Newcastle’s first real chance after the break. After a few half chances for the Magpies, Guthrie eventually found Cisse’s head for what looked like a free header and an excellent chance, however the new boy just couldn’t quite get his head over and the ball was lofted over the crossbar. can’t win ’em all though. Overall, the second half was generally more exciting than the first, with the game seemingly getting better as it progressed. The Villans had some periods where they were putting us under some strong pressure too. Villa manager Alex McLeish decided to pull off a fairly effective N’Zogbia for Emile heskey, cue boos from the home crowd for the ex Mag. Arguably though, it was probably on loan Robbie Keane (from LA Galaxy), who had the best case as Villa’s man of the match. However Villa weren’t getting the ball to Keane quite as much in the second half as thay were in the first. On the Magpies’ side though, as well as having our two first choice frontmen back, they were also receiving much better service in general than Best and Ameobi were in their absence. Moving on to “the main event,” Cisse’s debut goal for the Magpies, it came from a very nice cross from Gutierrez, something he is often criticised for by many armchair critics. Nice cross though it was, it seemed as if Richard Dunne should have cleared it really. He seemed to lunge at it half heartedly with his left leg but came up a little short, missing the ball completely. The ball uncleared, the debutant then proceeded to chest the ball down skilfully to the left, then firing a left foot volley of great power and accuracy right into the corner of Shay Given’s goal, giving the Irish shot stopper no chance whatsoever. The Geordies in the crowd then proceeded to go bananas at what was a top-notch goal to open his account with, though not untypical. Having watched the player in the Bundesliga for quite some time, it certainly didn’t surprise me, and I can also confirm that he can be lethal with both feet too! Newcastle United 2 – 1 Aston Villa. Also worthy of mentioning in dispatches was a thirty yard screaming bender from James Perch, which wasn’t far wide of the Villa goal. He’s had a forest’s worth of stick from the above mentioned armchair critics in the past, but he’s been doing a really good job of shutting them up now he’s been played in a defensive midfield position, which seems to suit him very well indeed on the evidence of the last couple of games, especially the one preceeding this one, where he was probably Newcastle United’s best player. Time will tell. Once again, this game wasn’t over by any means after our second goal, as the visitors continued to threaten for the remainder of the game. Most notably, it took another one of the flying Dutchman’s wondersaves to keep out the Villans in the 87th minute. An excellent Barry Bannan long range cross was swung in to the most dangerous of areas, with Craig Gardner diving in to glance the ball with his head. Krul showed his excellent shot stopping reflexes again when he parried Gardner’s point blank attempt, however it wasn’t over yet. The Dutch wonderstopper now faced an Emile Heskey sized missile (which isn’t small) flying in at him with some speed. With that big lump flying in at him, after brilliantly parrying Gardner’s effort, he now had to make a second save, gathering the ball with great aplomb before the bulky forward moved in for sloppy seconds. It was a magnificent double save, however if Krul had failed to gather, Heskey being Heskey, he may still have managed to blaze it over the bar from a yard or two outside the goal line! Thankfully though, we scraped through in the end to chalk up yet another victory with a one goal margin. Overall, it was a reasonably even game with qualities and faults on both sides, though I think we just about deserved the win overall. Newcastle United (4-4-2): Tim Krul (G), Danny Simpson, Mike Williamson, Fabricio Coloccini (C), Ryan Taylor (Gabriel Obertan 33), Davide Santon, James Perch, Danny Guthrie, Jonas Gutierrez, Leon Best (Papiss Cisse 14), Demba Ba (shola Ameobi 89). Subs: Rob Elliot (G), Shane Ferguson, Dan Gosling, Gabriel Obertan, Hatem Ben Arfa, Shola Ameobi, Papiss Cisse. Aston Villa (4-4-1-1): Shay Given (G), Alan Hutton, Richard Dunne (c), Carlos Cuellar, Stephen Warnock; Stephen Ireland (Barry Bannan HT), Ciaran Clark (Craig Gardner 85), Stiliyan Petrov, Charles N’Zogbia (Emile Heskey 66), Robbie Keane, Darren Bent. Subs: Brad Guzan, Andreas Weimann, Eric Lichaj, Gary Gardner, Barry Bannan, Nathan Baker, Emile Heskey. Goals: Demba Ba (30), Robbie Keane (45+5), Papiss Cisse (72). Yellow cards: Danny Simpson (37), Richard Dunne (39), Darren Bent (68). Possession: Newcastle United 51%, Aston Villa 49%. Newcastle United v Aston Villa full match link. Newcastle United v Aston Villa long highlights and post match interviews. It now appears that “Demba” is derived from an ancient root of the Jedi Knights and means “A Dark Lord of The Toon” – so the arrival of two full Dembas at NUFC is both prophetic and inevitable – the Force is with us ! Kind of detracting from the post, but anyone else a bit concerned with our squad’s interesting depth? We have enough quality players that I’m starting to think we may need Europe to play and keep all of them happy. Except we have no reliable cover for centre back! absolute ‘gem’ of a game to watch,had me out me seat continuously (never spilled me pint once).Up and downs aplenty with a bit of icing on the cake of joy to complement a great show. You have more freedom up front when you’ve got ‘a rock’ in Coloccini waiting to mop up haha….,great result….,bring on the spurs. maze202, its just something I’ve been thinking about and wanted to voice. It really only applies to midfield, but we have cabaye, tiote, jonas, obertan, raylor, hba, and guthrie who have all played regularly this season and then we also have marveaux, gosling, vuckic and abeid who are very promising. I would just hate to see them leave because we can’t give them games. we definitely need defensive coverage if we make europe that’s a given. johnny, I think the problem is that some of the players fit in with Pardew’s more direct style of play more than others. Of course, we’ve been doing fairly well so far, as Tony Pulis has at Stoke, but some of the players such as Ben Arfa or Vuckic would prosper more at teams which had a more sophisticated and more flexible manager. Players such as Vuckic and Abeid are still quite young too. Didn’t the fluorescent Gestapo tell you to sit down again cloggybob? N’Zogbia has hardly set the PL alight since he left for the greener grass. 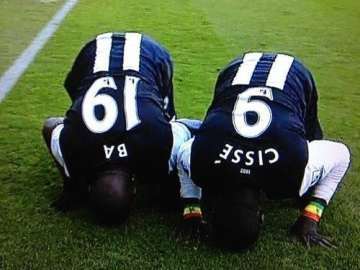 cisse great start with his first goal but cant help seeing after his first goal everybody is going on how he is already gone down in Geordie folklore history and stuff(well mostly lee ryder), one goal and he is already a legend!. Hopefully he does become one but its to early to be with the likes of past great number nine’s at this stage. If we could ever be consistent in the cups, that’d be a decent outlet for the fringe players. Europe would defo “solve” that problem. The first 10-15 mins of the match were pretty shocking, but both sides seemed to get some flow after Besty was subbed out. We defo need more strength in defense, esp w/Raylor sidelined for some amount of time. Any word on his situation? Howay Cisse – beat that against Spurs! Redknapp got away with it then. One law for the rich man – another law for the working man! Makes me puke. No doubt the champagne is flowing – in an area where rioters were out not so long ago. Well what a massive surprise that is…NOT! I dunno why they even bothered spending the money on a court case though, the result was more nailed on than a manure pen given by howeird webb. Justice in action or justice/inaction? Not a surprise to be honest. ‘arry’s ‘defence’ was as laughable as it was ridiculous, it’s a proper disgrace & i never use that word lightly. There were/are glaring holes in his defence & the court & jury are risible. I heard nothing but contempt for the procedure from ‘arry’s gob. Not unlike that ‘daily fail’ git in the leveson inquiry. These people think they can just do whatever…Oh! I’ve watched Papisco’s goal about 27 times now and am still enjoying it! Best would have chested it down perfectly then blasted it into Row Z, Shola would have been upstairs collecting the fares LOl! I particularly liked the way he just nonchalantly turned away and trotted over to the fans – reckon he knew it was going in before he even hit it! Things have changed as our team matures – Raylor out would not previously have been a problem – now we miss him. Meanwhile Jonas & Guthrie are more appreciated. Dare we now say that after recent performances Perch & Simpson will also develop as “favourites” – I sincerely hope so, and hope the team spirit continues to develop as “weak links” disapear. I reckon Simpson has silenced most of the doubters this season – just a pity it looks like he’s been tapped up? Perch has found his erm perch in defensive midfield I reckon – good cover for Tiote. most people were deriding our squad players. But when they’ve had some game time they’ve hardly let us down. Everyone has the odd bad game, but most of ’em are still pretty young & have been playing out of position. It’s been good to see them come in, when needed, & step up! Harry must have taken one of the directors of HMRC out to tea! I believe thats how it works. OK he might have been fiddling but it was hardly comparable to the Billions that mega-corporations have got away with, good luck to him I say. Bet any one else on this blog would would do likewise given the chance. Don’t know why he bothered though, £11k is nowt to him. -lack of depth: we can’t go into Europe with 3 (2? Colo? Please sign him…) CBs and 3 (2? Simpson?) FBs-all right footed? We also don’t appear to have a proper backup GK. -AP’s tactical rigidity: see Fulham away. I’m still disturbed that we didn’t respond to Johnson. That it fell apart so spectacularly was a one-off but it certainly highlighted this problem. We probably need to 4-7 first team players (depending on players leaving, kids’ development and Marveaux’s & Saylor’s recoveries). Damn. Zambia beat Ghana. If Ivory Coast win today they’ll be odds-on to take the cup. I’ve gone over and I’m rooting for them. Hopefully if wor Cheick gets his hands on some silverwear that mojo will rub off on our squad. tunyc says – “wor Cheick” – a good player but a little soon for that accolade I think. Having said that, I’m at a loss to think of anyone else other than Jackie who retains the “title”. Even if he proves to be our greatest ever no.9, I think “wor Cisse” might not stick – sounds like someone’s auntie, or even worse an uncle with a penchant for dresses. Like “Cissie and Ada” Supermac. er…i think Simpson, Perch, Raylor, Willo, Jonas, Best, Shola, Obertan, Saylor, Loverkrands, Guthrie (sure i’ve missed a few) have been derided over the last couple of seasons in some form or other on many a blog(various). workey – brilliant! and a dozen more on youtube to see later – many thanks. Sir Les the second? Reminds me of my brother’s mother in law, big Doris from Elswick. She once threw her bra at Tom Jones and nearly knocked him out. It looked like it was made at Vickers or Swan Hunters! Supermac, Robson said that United “made no appreciable effort to secure my signature” as a player. As a manager he was contracted to Barcelona. Incidentally, Robson did turn Barcelona down twice when he was at Ipswich, and Jose Mourinho also turned down an offer to be Robson’s assistant and eventual successor at Newcastle when Robson finally did come. We had a very lucky escape there, we could have stuck with Mourinho instead of enjoying the Souness years! Capello gone then. Maybe we can get him in if they take Pardew for England haha. Nah can’t imagine Pardew to leave. I may even watch if Guus gets the job. Super-I occasionally apply the “wor” sarcastically to players with particularly unlikely-sounding names. And of course should he earn it our new #9 will be “wor Rodney”. Harry getting orf theft / fraud at the old courts of justice suggests to me that he is capable of doing an OJ , if Harry’s guilt is uncertain he should do my tax return this year it would read NIL ! Sorry but they used to say never mind the agents fee whats arry’s cut ??? When you see the antics of some young players today I dread to think what they will be like if they become managers – football (like politics or banking) has become a money machine for those on the inside who milk the beautiful game and its loyal ordinary folk for every penny they can get. Whoever becomes England manager it will be mainly for the money (£6m+ a year) not pride, honour or service. Will someone step forward to do the job on a temporary expenses only basis? No chance ! But love him or hate him – that’s what Sir Alec did for Scotland when Big Jock Stein died at the final whistle of their World Cup qualifying match. Is their anyone left of that kind? ‘fraid not. Come to think of it – SAF as England Manager to see us through the finals ? In comparison to him everyone else is a dwarf! see that Senegal are scheduled to play a friendly later in the month against south Africa with no manager be interesting to see if he picks cisse and ba, which would also mean they miss the Sunderland game! I hope wasters like Ranger take note of the talented young lads being released by NUFC – and realises he is privileged to live the dream that has beenn shattered for so many other youngsters of high promise. “wor Demba” might get the response “which one?”. I wonder who will be the first young lad to be christened Demba in the NE? and how many in the next couple of years? Did you know that among the babyboom lads like me born just after WW2 the most popular christian name was Winston ? and I’ve never met any of them who own up to it! (including John Lennon). anyone else particularly fond of “The Dembii” or eventually “Wor Dembii”? Sorry about the lack of blogs recently lads. I wasn’t very well for a couple of days then my Internet connection went a bit wonky, then it went off completely. Seems to be working a bit better now though and so do I. Does it keep running away Supermac? Hey was wondering if anyone had any away section tickets for sale when @Arsenal on the 12th of March. Would love to sit with fellow Toon fans, as opposed to the Arse fans. Hoosiertown, did you join as a member? No I have not. I wasn’t sure how that worked to be honest. Can I only buy an away ticket if I am a season ticket holder? WOW ok thank you very much. What a rediculous policy. I guess I’m going to have to pay over £70 to some online resale site and sit with the Arsenal fans if I want to go, because Arsenal does the same exact thing for their box office. Members only there too. Disappointing. Hoosiertoon, Nee botha. Have you tried speking to someone in the NUFC Box office about your predicament? To all, normal service should be resumed on the blog front from tomorrow morning. Aye, shite service as opposed to no service at all Supermac, a bit like Virgin Media. Can’t believe ‘fans’ would rather have redknapp over Guus. but they should be able to find one to fit. Who ruled Pardew in for him to rule himself out Clint? And what difference does it make what region of the country the manager comes from? Can you think of any credible candidates from the north of England? i’m guessing that my humour is lost in translation then? Actually though, the bookies had AP as third fave, & england is London Utd, everyone knows that. Lastly, i couldn’t give a flying **** personally, i support NUFC. I come from a little country just north of england, just south of scotland, Geordieland! I could care less if a northerner got the ‘chalice’ either. Down with the monarchy too, while we’re on. ‘arry can “barely read & write”, so he’s a canny candidate. Maybe he was lying in court though? That’s four Yorkshireman, two Londoners, one Smoggy, one Durham, one Cheshire, one Middlesex, one Nottingshire, one Surrey, one Essex, a Swede and an Italian. One of the Yorkshireman (Wilko) and the one from Essex (Peter Taylor) hardly count as they were caretakers with three matches between them. That’s seven northerners, five southerners, a midlander and two foreigners. Without Wilko and Peter Taylor it’s six northerners, four southerners, a midlander and two foreigners. So perhaps it isn’t “London United” after all Clint, perhaps it’s “Yorkshire United”? Isn’t everything south of york, london? Ok then, south of Richmondshire! It’s all by the by & not for the likes of us.